Yes, this is Canada's John Macleod and the Rex Hotel Orchestra. And yes, this is the ensemble's third CD, The Toronto Sound. But close your eyes and listen carefully and it modulates into no less than an earnest albeit clandestine homage to Rob McConnell and the peerless Boss Brass. Is that a good thing? Beyond any doubt, the answer is a resounding yes. What's more, the RHO has taken the baton from a master and raised the bar even higher. To put it another way, when it comes to contemporary big-band jazz it simply doesn't get any better than this. MacLeod himself was once a member of the Boss Brass, as were at least seven of his colleagues on the RHO including two of its section leaders, alto saxophonist John Johnson and trombonist Alastair Kay. Their expertise helps place MacLeod's orchestra above and beyond most others, as do the luminous French horns (James MacDonald, Janet Anderson), another keepsake from the Boss Brass. Add to the RHO's leverage a series of superlative charts by Rick Wilkins, Andy Ballantyne, Terry Promane and MacLeod and you have a decisive winner. The winning streak begins with Wilkins' typically lovely and charming original, "I'm All for You" (a thinly disguised version of the standard "Body and Soul"), showcasing the venerable tenor saxophonist Perry White in front of superior work by the ensemble. "Green Stamps," which follows, was composed for a quintet by the late Bob Brookmeyer and rearranged for the orchestra by MacLeod. The spot-on soloists are pianist Brian Dickinson, trombonist Promane and trumpeter Brian O'Kane. MacLeod wrote the two-part suite "B.V." and "A.V." ("before" and "after" Virginia) for his wife, saying of the latter that he "tried to compose something as beautiful as she is, but . . . gave up and opted to write something happy-sounding instead" to celebrate the changes she brought into his life. Suitably, MacLeod takes center stage on both movements, with support for his muted cornet on "A.V." from bassist Jim Vivian and drummer Ted Warren. Ballantyne's gritty "The Phone Don't Ring Jack" is pure fun, amplifying keen statements by trombonist Rob Somerville (using a plunger mute) and trumpeter Kevin Turcotte. "Jack" precedes MacLeod's kinetic "Polar Vortex," ushered in by Joey Goldstein's guitar and featuring crisp solos by baritone Bob Leonard and trumpeter Mike Malone (the current leader of the Dave McMurdo Big Band). Kay's husky, "talking" trombone is the centerpiece on MacLeod's subdued arrangement of Duke Ellington's "Mood Indigo" (on which Vivian also solos), while tenor Mike Murley does the honors on Billy Strayhorn's cheerful "Isfahan," also arranged by MacLeod who then plays muted cornet and "sings" on the trad jazz evergreen, "Saint James Infirmary." That leads to the flag-waving finale, "Hold It Down," a fast-paced blues that MacLeod co-wrote with his stepson, Owen Gongos. Sure-fingered solos are delivered courtesy of Dickinson, Johnson and Somerville, the last sandwiched between a walking midsection and decisive shout chorus. 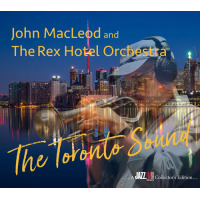 Whatever its provenance, The Toronto Sound lives on in all its grandeur, thanks to MacLeod's superlative Rex Hotel Orchestra, an all-star ensemble if ever there was one. As noted, this is the orchestra's third recording; if you've not heard the others, by all means do yourself a favor and seek them out. Track Listing: I’m All for You; Green Stamps; B.V.; A.V. ; The Phone Don’t Ring Jack; Polar Vortex; Mood Indigo; Isfahan; Saint James Infirmary; Hold It Down. Personnel: John MacLeod: cornet, flugelhorn, leader; Jason Logue: trumpet, flugelhorn; Kevin Turcotte: trumpet, flugelhorn; Brian O’Kane: trumpet, flugelhorn; Mike Malone: trumpet, flugelhorn; John Johnson: alto sax, flute; Andy Ballantyne: alto sax, flute; Perry White: tenor sax, flute; Mike Murley: tenor sax, clarinet; Bob Leonard: baritone sax, bass clarinet; James MacDonald: French horn; Janet Anderson: French horn; Alastair Kay: trombone; Terry Promane: trombone; Colin Murray: bass trombone; Joey Goldstein: guitar; Brian Dickinson: piano; Jim Vivian: bass; Ted Warren: drums.